One of the best ways to make your garden more productive is to keep planting until you run out of growing season. As vacancies appear, fill them with vegetables that grow well in the autumn. I sort autumn vegetables into three planting groups based on two criteria: time left in the growing season and soil temperature. By early August, time is the deal killer for broccoli, cabbage, and their close cousins in all but the mildest winter climates, but there is plenty of time to grow other cool-natured vegetables rated at less than 60 days to maturity. Keep in mind that when growing anything in autumn you should add about three weeks to the maturation times given on seed packets. Just as soil temperatures near the surface rise rapidly late spring and early summer, they decrease quickly in late summer and early autumn. To get a good idea of your soil's temperature 4 inches (10 cm) deep, Metcheck provides local soil temperature information. Hot soil can inhibit the germination of many seeds, but several otherwise cool-natured crops germinate very well under high temperatures. These crops make up the first group discussed below. The second group won't germinate in hot soil, but you can start the seeds indoors and set out young seedlings. The third group of fall vegetables sprouts and grows so fast that you can wait until the soil cools down to plant them. When grown as autumn vegetables, these seven crops will germinate rapidly in surprisingly warm soil as long as they are kept moist. Ideal germination temperatures range between 65-85°F/18-30°C. Maintaining moisture can be a challenge, so sow seeds just before a period of wet weather is expected if you can. Covering seeded beds with old blankets on hot, sunny days also can aid germination. Peas are worth a try in many areas, but be sure to use very fast-maturing varieties (most are dwarf). So-called leafless or afila varieties are naturally resistant to powdery mildew (prevalent in late summer) because they have few leaves. Beetroot may surprise you with how quickly they germinate in late summer, which is lightning fast compared with their behaviour in cool spring soil. Carrots grown in fall taste extra sweet thanks to cool soil temperatures, but you will need to keep the seeded bed moist for a week to allow ample time for sprouting. Collards can be grown through winter in mind climates, but they are also great when grown as a fast fall crop. Broadcast the seeds over a prepared bed, and harvest when the young leaves are the size of your hand. Kale is a shade hardier than collards, and the plants are so frilly and colourful that they qualify as edible ornamentals. Leeks sown in autumn may only reach pencil size before winter comes, but seeds more than two years old may lose viability by spring. You may have nothing to lose by planting them. Radishes to grow in fall include familiar salad radishes and huge daikons, which love to be grown in autumn. These crops sprout best when soil temperatures stay below 70°F/20°C, but if you wait until the soil cools to plant them, they may not have time to mature. 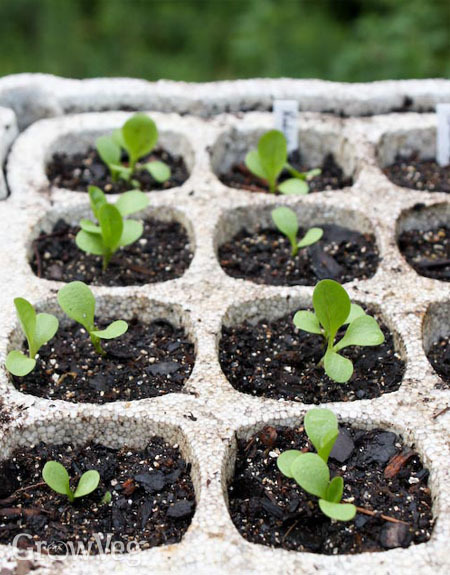 Start seeds indoors or in a shady place outside, and set out the seedlings as soon as they show their first true leaf. Transplant in cloudy weather, or cover the babies with flowerpots for a day or two to shade them from late summer sun. Chinese Cabbage is always a success among fall vegetables, and it's as easy to grow as lettuce. Endive and escarole grown in the autumn garden have big, crisp hearts, and they taste less bitter compared to spring-grown crops. Radicchio can be harvested once in the garden, and again in winter from forced roots. Lettuce seedlings may appreciate slight shade during hot, sunny spells. A hoop type tunnel covered with lightweight cloth is ideal. Parsley seedlings that are nicely rooted when winter comes stand a good chance of surviving until spring. Spinach can be planted three times. Start a few seedlings indoors for an early autumnl crop, and sow more outdoors when soil temperatures are below 70°F/20°C. A third sowing can be grown through winter beneath a protective frame for harvesting in early spring. Signs of autumn are often apparent by the time the soil cools enough to grow the leafy greens that define many autumn vegetable gardens. Diversify by trying new varieties, especially Asian greens like mizuna and tatsoi. Cool temperatures tame flavours, so many gardeners wait until after a frost or two have passed to harvest rocket and various members of the mustard family. Rocket grown in autumn has wonderfully mild flavour, and autumn-grown plants become large and leafy and rarely show interest in bolting. Coriander is another crop that bolts right away when grown in spring, but holds much longer in the fall vegetable garden. Lettuce from your autumn garden may include the same varieties you grew in spring, or you can choose varieties based on their cold hardiness. Many catalogues offer cold-tolerant "winter" lettuces. Mache (Lamb's Lettuce) is the miracle green that sails through winter with minimal protection and fills your salad bowl first thing in spring. Mizuna and other mustards grow so vigorously that they can be used as edible cover crops. Turnips produce both greens and crunchy roots that will store in the refrigerator for several weeks. They are embarrassingly easy to grow. No fall vegetable garden has room for everything, but by choosing favourites from these lists and giving them a proper start, you will have an abundance of fresh veggies for months to come. "I was very interested in your comment about hot soil inhibiting germination of seed - which might explain why I've had such poor results from a range of seeds in my south sloping potager this year near Bergerac. Tried the link to Metcheck but for some reason it will only do hobbies for United Kingdom - have tried clearing cookies to no effect. Shame - I was really interested to see what the forecast for soil temperatures round here might be............"
"My pumpkin has a runner about 10ft long which is using a skafle board to run along to reach the ground because i grew it in the compost bin it comes from a pumkin which grew to 103lbs/47kgs is it possible that this is a plook or will mine grow that big also it has a couple of other small runners do i cut these off do tell"
"Thanks Great article. Last year our fall planted spinach wintered over beautifully here in rural central Pennsylvania despite a freakishly early heavy snow in mid October. This year we are trying again with overwintering spinach. I'm trying 7 different varieties to see which does the best. Our seeds that we planted on Sept 1 are up. And this weekend we'll be planting more as our tomatoes finish up. Another tip I discovered inadvertently has to do with fall broccoli. We planted out the seedlings in mid August in the spot where early peas had grown. Something started to eat the little plants, so I covered the bed with a row cover but mistakenly used a heavy one which I would normally use in late fall to protect from frost. The row cover stayed on for a month. During this time we had a drought with very little rain. Despite this, my broccoli are thriving. In fact they are twice the size of anyone else's broccoli in our big community garden. The heavy row cover created an ideal micro-climate, providing some shade from the late August sun, keeping the soil moist to conserve what there was, and protecting the plants from the white cabbage butterfly caterpillars." "Thanks for the article and the link to the soil temperature map. Last year after I ate all the lettuce I wanted I let the plants go to seed and when the temps were perfect for sprouting the seed I had a literal "carpet" of lettuce. There was so much that I pulled up quite a bit and made sprout salad which was very tasty. What was left, I let grow to full size then harvested and ate it all through the summer. I hope to get more "carpet lettuce" this early spring. Happy surprise gardening!" "Hi! I am new to gardening and did OK with my spring/summer garden, thanks to this website. I have planted my fall garden around the few tomato and sweet pepper plants left that still have quite a bit of immature fruit. I live in Zone 7 (Atlanta, GA) and colder weather is expected in coming weeks. Is there a way to force the immature fruit from the summer plantings to mature? Should I give up on this expectation? Thank you. " "Thanks for the information about cool crops. The hints about soil temperature and date of maturation were most helpful. "